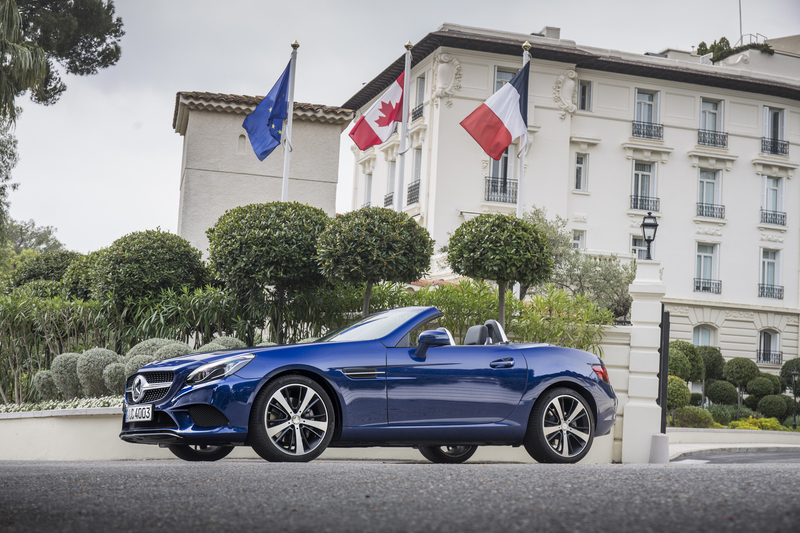 NICE, France - The roots of the 2017 Mercedes-Benz SLC-Class were innocent enough. Two decades ago, the petite roadster debuted with a neato folding hardtop and naif Euro headlights, only to quickly become the whipping boy of manly convertibles everywhere. Things didn't get much better from there. 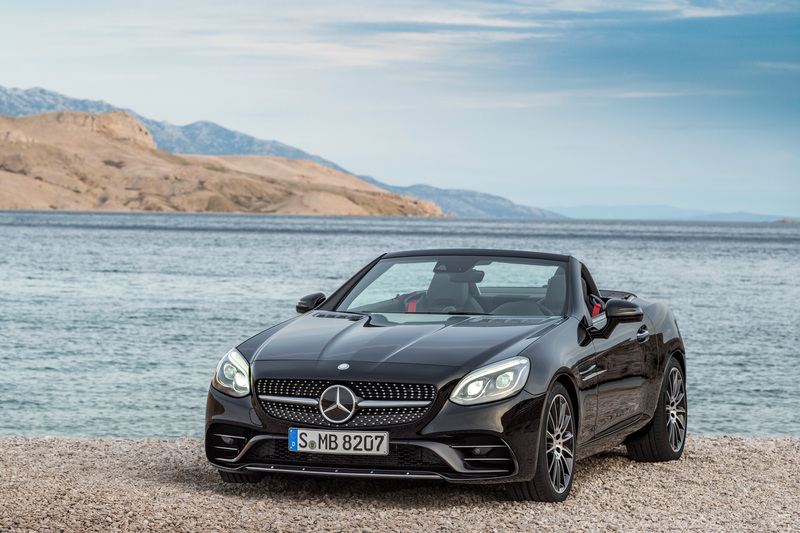 "It's still a hairdresser's car," said an unnamed (and now underemployed) Mercedes PR flack of the then-SLK upon the debut of the second-gen car, roundly dismissing its meaner mug and SLR-inspired nose. Despite multiple updates and another generation since, the roadster has continued to be dogged by a softie stigma. 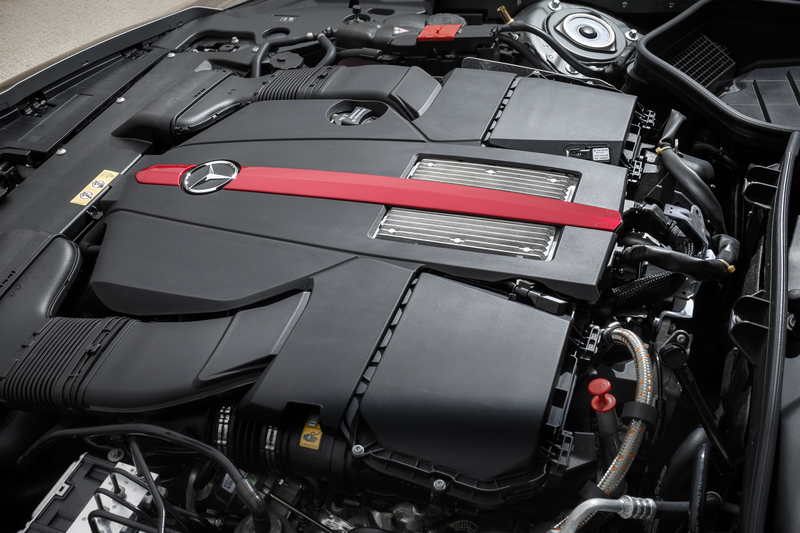 With the SLC, Benz is out to eradicate that perception once and for all. But will its revised surname, burlier looks, and enhanced sportiness finally be enough to leave the old car's rep behind for good? 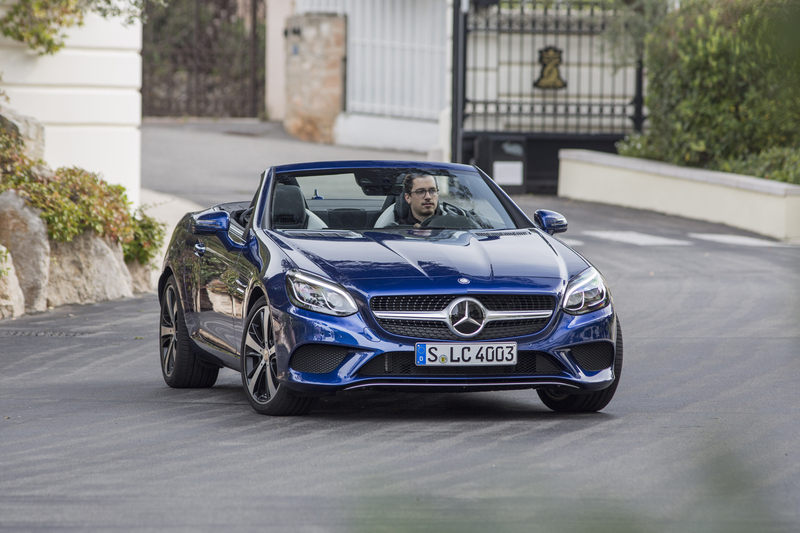 We set out to find the answer to that question in the craggy hills of Southern France, where we sampled the entry-level SLC300 and (semi-) hopped-up Mercedes-AMG SLC43. 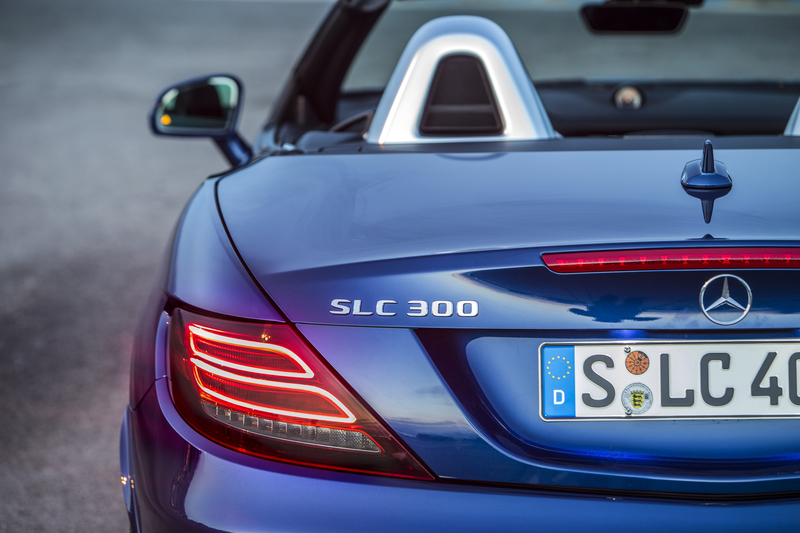 While primarily an evolution of the third-generation SLK, the SLC's new name strengthens its associations with the C-Class family, from which it derives some of its technology and styling cues. The lineup starts with the SLC300, which sports the same 241 horsepower, 2.0-liter turbo inline-four and nine-speed auto as the SLK300 it's replacing, with a matching 0-60 mph time of 5.8 seconds. New safety features include Collision Prevention Assist Plus, which works with the radar-based brake assist system to automatically slow down the vehicle when collision is imminent. A backup camera, automatic trunk partition, and sport exhaust are now standard. 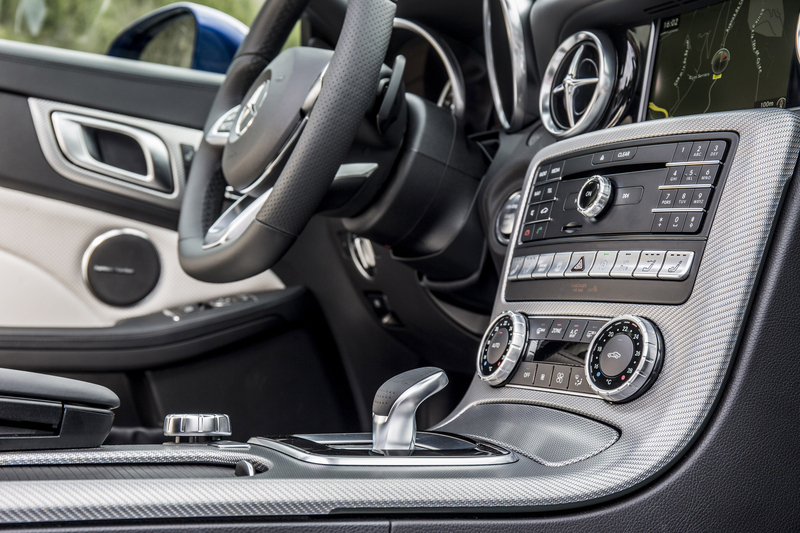 Interior upgrades include a bigger, 7-inch multimedia screen, redesigned instrument cluster, updated steering wheel, and slightly tonier touches of aluminum trim. 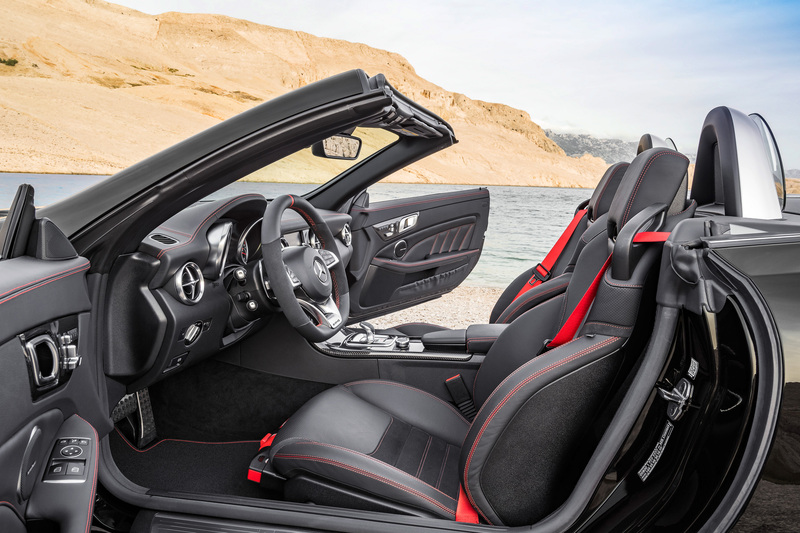 The SLC300's demeanor is focused but not fearsome, placing two occupants into a relatively neutral - if somewhat purposeful feeling - cockpit whose architectural uprightness complements the sternness of the exterior. Our tester's matte gray on red color scheme conveyed an overarching element of seriousness. Make no mistake: This is an unapologetically Teutonic take on the compact two-seat roadster. 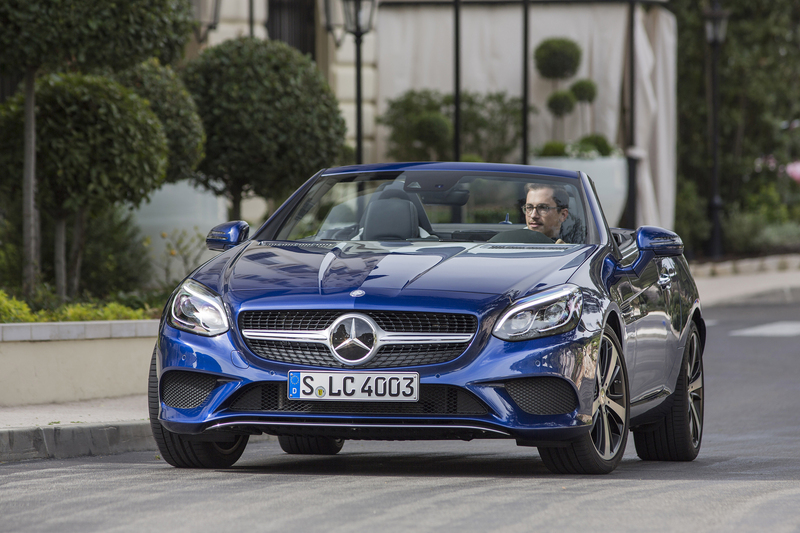 Our generously optioned test car felt tidily finished and well-constructed, though a back-to-back drive with the new six-figure S-Class cabriolet drew inevitable focus towards some of the SLC's weak spots, like its curiously hinged, palm-sized cover for the power top switches. While lacking the sense of occasion found in the new Audi TT convertible's cabin, the SLC nonetheless stands up to competitors like the BMW Z4 Roadster and Porsche Boxster, offering a snug, maturely appointed spot from which to take in the elements. With a respectable curb weight of 3,296 pounds (lighter than the TT and Z4 but roughly 300 pounds heavier than the Boxster), the SLC300 hustles its mass through corners effectively, staying planted with solid body control and steering feel. Off-the-line and midrange power is undramatic, but wring it out in the right gear and mode, and the tail can step out nicely, especially in the lower (and shorter) gears. Torque plateaus between 1,300 and 4,000 rpm, but the peak output of 273 lb-ft is in no danger of setting the road on fire. Key to managing the car's demeanor is the Dynamic Select button, which opens a menu controlling suspension damping, steering effort, and drivetrain settings. Opt out of the pre-set Eco, Comfort, or Sport modes, and an Individual mode enables the parameters to be independently managed. Sport+ and Sport Handling (selected via the ESC Off button) are best suited for tight Alpine switchbacks, offering dialed-in feedback and excellent automatic shift points. We would have preferred more obedience from the paddle shifter (finished in an electroplated surface with the Sport package), though those who put their faith in the computer's logic are likely to be less disappointed with the nine-speed gearbox, especially since the downshifts are nicely rev-matched and the upshifts relatively swift. Hard, repeated braking during downhill hairpins produced whiffs of white smoke from the overworked rotors, but overall stopping power remained. All in all, the entry-level SLC held its own on these challenging roads. The outgoing AMG SLK55 was a nasty brute of a thing, a snorty, naturally aspirated V-8 holdover that resisted the trends toward downsizing and forced induction. The 415-hp engine was also improbably stonking for a small car, making for aurally entertaining acceleration but nose-heavy handling. 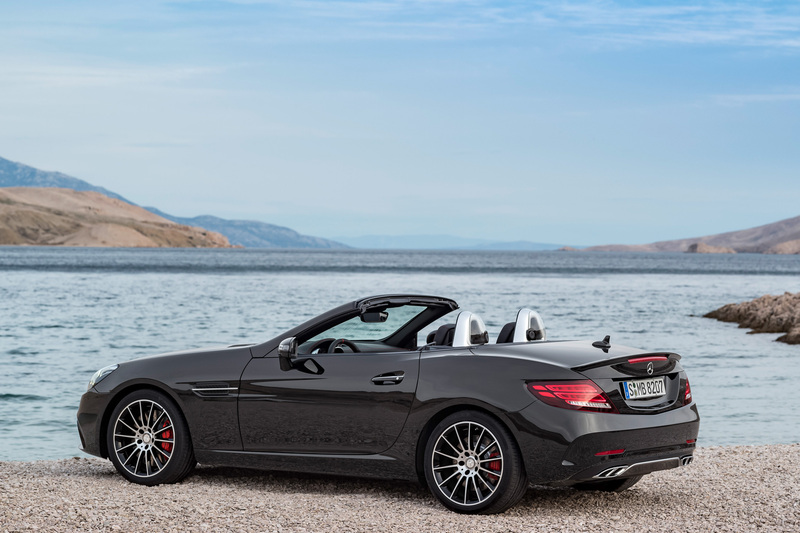 Catching up with the times, the SLK43 gets its motivation from a twin-turbo 3.0-liter V-6 producing 362 horsepower and 384 lb-ft of torque, peaking between 2,000 and 4,200 rpm. Power is down considerably, but the 0-60 mph sprint only suffers by a tenth, with the new car doing the deed in a claimed 4.6 seconds. Off the bat, the V-6 engine's bark beats the SLC300's by a mile (especially when the adjustable exhaust is set to Sport). But gone is the acoustic richness of the big V-8, replaced by a tamer, more aircraft-like sound. 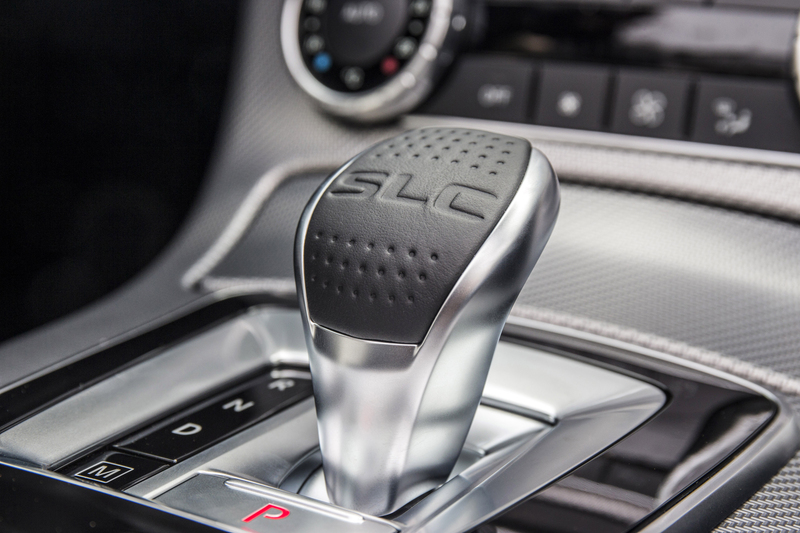 Manually shifting the nine-speed transmission via those electroplated paddles might seem like the sportier way to swap cogs, but waiting a split second too long to shift near redline can result in frustrating lags. Also penalizing the DIY enthusiast is the occasional missed downshift when the left paddle is tapped. As with the SLC300, it's best to leave it in Sport+, turn ESC off (which isn't really off), and trust the machine to handle its business. 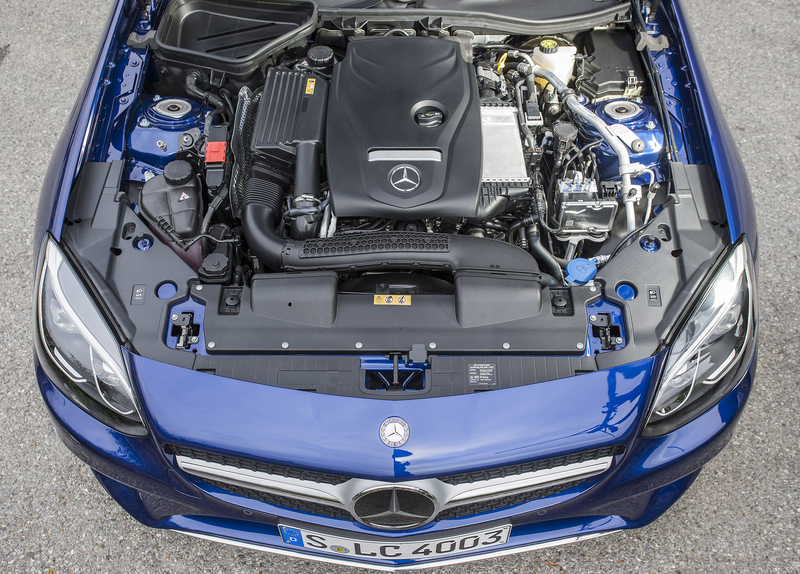 Though the outgoing V-8's ponderous proboscis problems have largely been ameliorated, the SLC43 still harbors heft, losing only 65 pounds over the SLK55 for an estimated curb weight of 3,518 pounds - pretty porky for such a little pipsqueak. But there's more advantage gained by better balance, as the new car addresses the road with easier turn-in and yaw capability. While the adjustable dampers aid the cause, the benefits are more strongly attributed to the front kinematics, which have been tuned similarly to that of the C63. Aiding the effort are stiffer transmission mounts, which edge the SLC43 slightly away from the cruiser domain and closer to sportiness. Compared against each other, the 2017 Mercedes-Benz SLC300 and SLC43 are perfectly satisfying roadsters that have expanded their repertoires to become more engaging (and much more manly). The 300, better balanced but lacking in absolute grunt, complements the 43's extroverted and more exuberant personality. 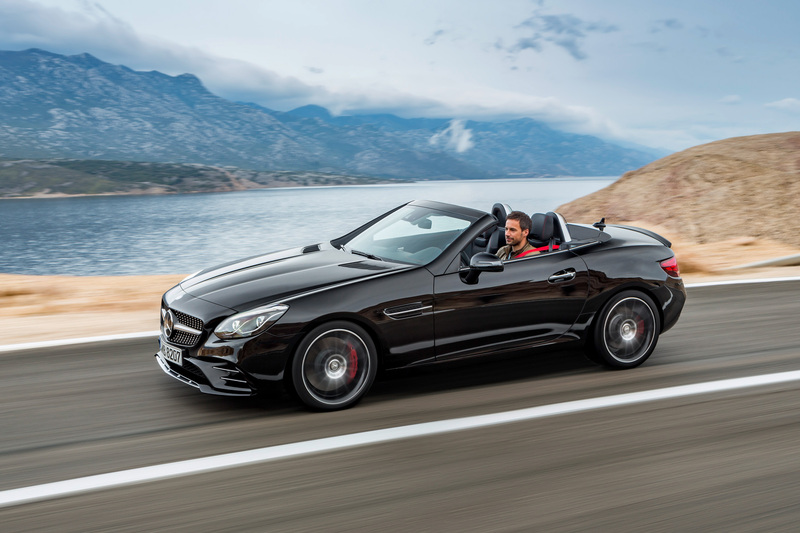 While the model's stigma may remain (and something, on a sensual level, has certainly been lost with the departure of the SLK55's naturally breathing V-8), at least the cars are comfortable in their skin and consistent with Mercedes-Benz's sporting-yet-composed spirit of late. The three-pointed star won't be competing with Porsche's Boxster anytime soon - or ever, for that matter - and ultimately, that's alright. SLC drivers are unlikely to wake at the crack of dawn on a Saturday to autocross, and likewise, Audi and BMW drivers don't aspire to Merc-style roadsters. It's for the best at the end of the day, isn't it? After all, what would the world be without a choice between chocolate and vanilla?